The Qld Government Solar Battery Rebate. DON'T BE FOOLED! As most people have worked out, solar batteries currently make little financial sense. However, since the announcement of a $3000 rebate through the QLD Government Solar Battery rebate, the interest has skyrocketed. 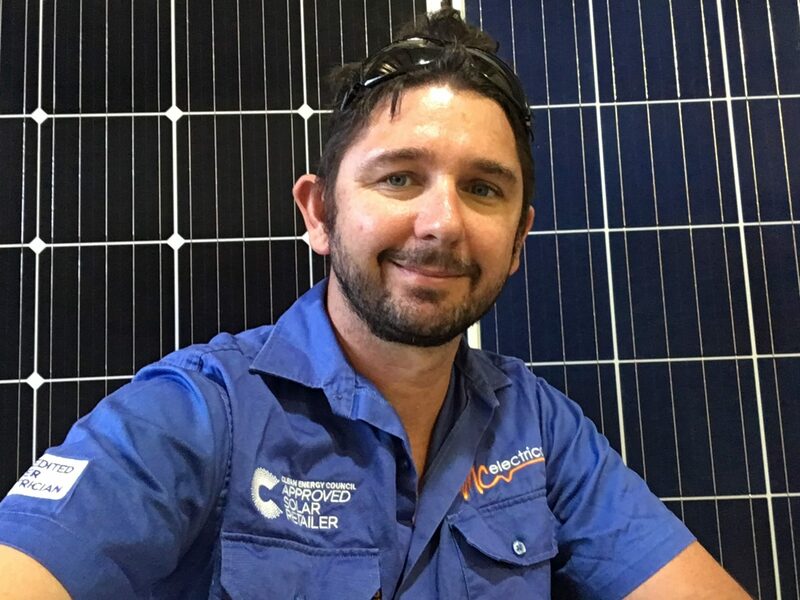 A lot of people are under the impression that, with the help of the solar battery rebate, now is the time to install Solar batteries in QLD – this post aims to show it is not. 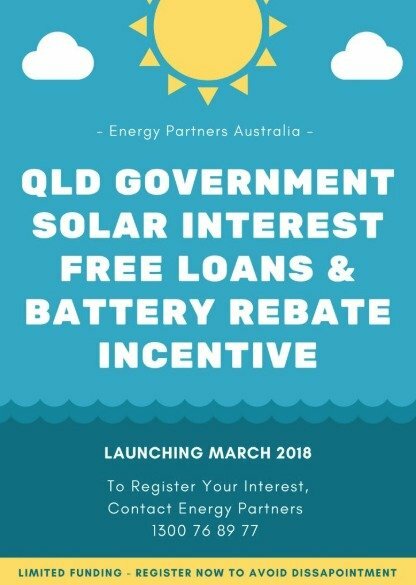 To be eligible to receive the QLD Government Battery rebate, you need to utilise an Approved Solar Retailer who is participating in the scheme. Those in the industry knew the interest would be large, so many jumped on board and applied to become Approved Solar Retailers. This allowed them to take advantage of this heightened interest. From 2013 to December 2017 there were 48 signatories around the country – a very select bunch. From January 2018 alone, there have been an additional 84 signatories. So, that means it took five years to get 48 signatories, but just one year to get 84. This exponential growth in approved retailers has been great for raising the bar in the industry. We were the 24th company to sign the code, falling somewhere in the middle of early interest. However, we’ve chosen not to participate in the solar battery rebate because it’s still not in the best financial interest of the average Joe. Although the idea of promoting batteries is good for the grid, the payback period, unfortunately, is not. The concept of batteries is simple. Any power you generate in the day and don’t use (excess power), is stored in a solar battery. At night, when solar generation has stopped, the battery kicks in to provide the household with that “free” excess power. Most people mistakenly value this excess power as the rate they pay their electricity retailer. However, we need to remember that this excess power could have been sent back to the grid for a feed-in credit. Therefore, the actual value of this excess power stored in a battery is the electricity rate (or T11) minus the feed-in tariff. 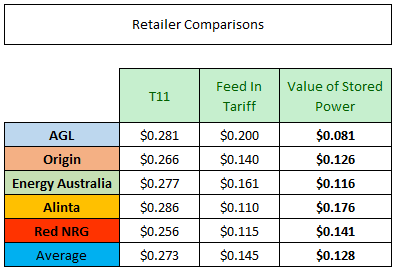 The table to the left shows five of QLD’s more common electricity retailers. The first column is their T11 rate; the second is their feed-in tariff. The third column calculates the difference between these figures, which ends up equaling the value of this “excess power.” This figure helps us determine the value of solar batteries. When we average out these rates, we see that every kWh used from the battery is worth $0.128, not $0.273. 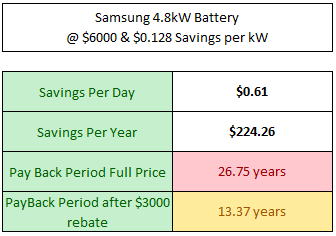 Now we have the average savings per kW a battery can provide. Let’s see how that stacks up for payback periods. We’ll use two common examples of solar batteries in today’s marketplace. The 13.5kW Tesla Powerwall, and the 4.8kW Samsung. Let’s assume the best case scenario – no rainy days for the entire year, the Tesla Powerwall can charge its full 13.5kW storage capacity, AND the household uses every ounce of it each night. We, therefore, multiply 13.5 by $0.128 to get our savings per day, then project this to a year. Now we divide it from its conservative $12 500 price tag to get the payback period. As you can see from the table, our best case scenario for full price is a 19.82-year payback. Even accounting for the $3000 solar battery rebate, we’re still at 15 years, five years past the Powerwall’s ten year warranty period. Let’s apply the same best case scenario to the smaller Samsung Battery. Multiply its 4.8kW capacity by $0.128 to get our savings per day. Project to a year, and divide this from its $6000 price tag. The results are a bit funny. Without the solar battery rebate we get an excessive 26-year time frame, but with the rebate, the time frame is just over 13 years. Although better results than the Tesla Powerwall, we’re still three years past the Samsung’s ten year warranty period. 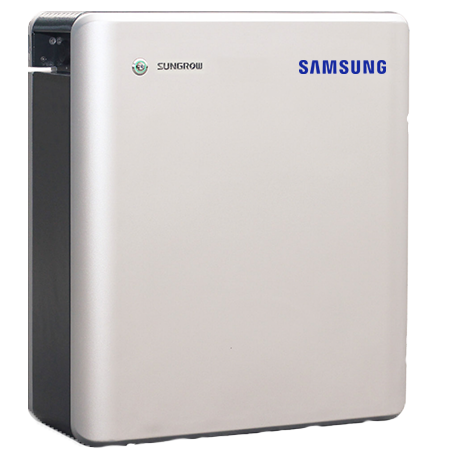 The Samsung has the additional disadvantage of only offering a 3kW continuous discharge, so heavy night usage may not be covered. We also have to remember these are the best case scenarios. Rain is going to affect these calculations, as are holidays, heavy daytime usage and periods of system downtime. Solar Batteries also degrade over time, so both the Powerwall and Samsung will not be storing their full capacity five years down the track. For these reasons, we would need to see payback periods significantly under their ten year warranty periods before we would consider them as a financial investment. To summarise Ronald, solar pays for itself; batteries do not. Although the Solar + Battery combination pays for itself within eight years, the solar will be contributing heavily to this payback. The battery may be sitting at 15 years to pay off, while the solar is at 3. For this reason, it makes far more sense to forgo the battery and proceed with just the solar installation. If you see these combined payback period tactics, I would always recommend asking your consultant to separate the battery from the solar. This way, you can perform your own calculations to see where the true savings lie. When Do Solar Batteries Make Sense? A cheeky answer I was tempted to write was “in the future”. But there honestly are some cases that exist in the present. Consistent grid outages can make solar batteries a viable solution. As the solar was unable to be exported anyway, the savings value is actually the retailer T11 rate. This means every kWh used by the solar battery is worth $0.273 as opposed to $0.128. However, even substituting $0.27 as the figure for whole value, we’re still around 10 years for payback. It’s nice being able to maintain normal power usage while the rest of the street may be in darkness. This is something solar batteries offer. I would argue this is the main if not the only reason to install a battery. Financials aside, the price of keeping your household powered up might be more valuable to you than payback periods. While Solar Batteries lessen your dependence on fossil fuels, switching to solar has a far better impact on the environment than batteries. The concept of the solar battery rebate is good for the grid, but they pose little financial advantages for the customer. We have elected to stay out of the QLD Government Solar Battery Rebate Scheme. Although the idea and selection criteria set by the QLD Government is robust, unfortunately, the battery payback period doesn’t align for the customer. There may be others pushing for batteries as having high returns, but they could be using blended payback periods. Because solar panels are the superior financial incentive, it makes sense to first consider more solar panels over a solar battery. Remember – you can always add a battery later when the numbers do stack up. There’s no need to rush into it now just because there’s a solar battery rebate. 23 Comments on The Qld Solar Battery Rebate – Are Batteries Worth It Now? Hi Mark - I've had some good chats on Whirlpool forums regarding that point you mentioned - the battery being a necessary evil to "unlock" the loan. And I do tend do agree that this is the best use of the loan. It does seem a shame that that battery really isn't going to do much, and it's not going to solve the grid constraints, which I imagine was the initial intention of the grant. I too think the cheaper battery option makes sense. As long as your payback is the same or close to buying "solar only," and you have no other interest free avenues, then this is a good purchase. Hi Ben - I'm still trying to come to terms on what to do. I have received approval for the grant/loan. I have received two quotes both offering Phono Mono Cells (6.5KW) and a Fronius inverter. However one offer is for a large battery (LG Chem 7 KWh) whilst the other is for a much smaller battery (Solar Watt 2.4KWh). The supplier selling the smaller battery is saying that the battery is a 'necessary evil' in getting the grant + loan. And that I shouldn't focus on the battery at all rather selling power back into the grid and benefiting from EA's (or another retailers) feed in tariff. I ultimately need to pay around $300 to get the full package whereas the more expensive battery see me outlaying an additional $5k. Seems that the cheaper battery option makes more sense. Hi Lawrence, Thanks for the feedback. A BESS system would be the worst thing you could add into an approved 44c FiT site. You would essentially be losing at least 20c per kWh exported (24c - 44c). So, storing power is the last thing you would want to do, if that power is worth 44c exported. Hi Ben thanks for your transparent and objective advice. I have several solar customers in SE Qld still on the 44 cents Qld Solar Scheme FIT who want to change to a BESS System. Have you any advice for them on this subject regarding both the commercial viability and in particular if their eligibility for the 44 cents FIT would remain intact by the change over to a BESS system. Hi Niki, I assume when you say the out of pocket amount is $1000, that the entire system + battery is therefore $11 000? That is extremely cheap, if possible would you be able to share what size system you are getting, and what size battery you are getting? While you say it is still a significant saving to your husband and yourself, I can guarantee the savings of solar only would be better. However, you bring up a point where you are unable to get into solar, so this scheme is a great way to enter the market. The interest free component is therefore - to me - the main valuable component of the scheme. However, I do worry that companies would be trying to get system prices close to $10 000, meaning the end customer is left with a cheap, low storage battery, and/or a cheap, smaller system. However if you are happy with the system size, components, and company, and were unable to get solar without the interest free loan, then yes, this scheme is a sure winner. But for the majority of people a re-draw on their mortgages, or a 6.12% Greenloan for solar only, is the better saver. Hi David I can see that you but a lot of work into the maths for this. However, I have a simpler viewpoint. I have applied for the loan and grant. I will be paying back the loan over 10 years interest free for the solar panels - so they are what is costing me. The quote I have at this time is an out of pocket amount of $1000. Therefore the battery is costing me $1000. Going by previous electricity accounts, that amount will be absorbed in less than a year of decreased grid electricity usage. I can't be more exact than that as I have changed from a 5 person household to a 2 person household and don't know exactly what my energy usage will be. Even taking into account that the battery will not be the highest quality and may only last 5 years, that is still a significant saving to my husband and I. So for people who have been eager to get into solar for many years, this is a great way to get us set up with solar and batteries. We are willing to take the risk at this time because we know that there is a lot of work going into improving battery technology and the government scheme allows us to wait and save up for the best battery system when they become available. Hi Ben, you make a good point when using the Powerwall as the benchmark, if you looked at it from the perspective of a say an LG 3.3 at just around the 3.5k mark your essentially getting a battery for very little in a combined battery and solar panel setup and the entire system on a 10 year interest free loan with no upfront cost to the consumer. the battery performance is largely irrelevant as the consumer no longer has to come up with the $7000ish for an entire system upfront. Hi Blake. The interest free component is great, and probably the only part that makes a lot of sense. 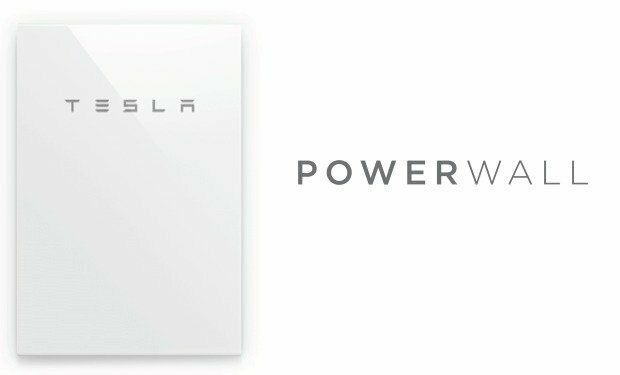 Unfortunately, the battery with the cheapest price per kW is the Tesla Powerwall 2 - which comes in at $13 000. After the grant that's $10 000, and pretty much the entirety of the interest free loan absorbed. You will still need to pay for the solar system like normal without the interest free component, so you're actually no better off as you could have done this from the get-go. Hi Ben, Have you looked at it from the Grant and Interest free loan perspective with an up too $10,000 interest free loan(10 Years) for a combination battery and solar system it would create a lower barrier on entry for households. obviously this depends on the overall cost of the system. it seems like your potentially missing consumers who would struggle with an upfront outlay. Thanks for sharing! You have very nicely explained the role gravity played in electricity. These are all interesting electricity facts. All the best! Excellent analysis guys. I agree batteries are a marginal investment at best and that the bulk of the savings are going to come from the solar. Having said that, I do think there is a market for people who aren't focused exclusively on the economics and might want to go ahead anyway. Thanks Peter. AGL used to offer 10.6c, but they recently announced their 20c FiT offer. Excellent post. As someone who works in the solar industry I completely agree. It may pay to also note that there is an additional "unreliability Factor" with Hybrid battery systems. Similar to Optimizer type systems. People who purchase them add a level of unreliability to their solar and given the data from the ACT battery test centre showing cycle life way below what "the marketing hype suggests". This should also be considered. In my opinion. If you want batteries thats awesome. I have them on my house. But do it for the right reasons, like wanting a carbon free house, or telling Ergon to stick it... ot perhaps a great desire to be cool and tell your friends.. Not because you believe it's the best ROI or have been fooled by a flashy sales pitch. It would great if someone with requisite knowledge and skills could compare the cost of the battery system in the Tesla 3 and the Powerwall 2. I suspect batteries in home ESS systems are several more expensive than the the Kw cost in EVs. The Tesla Powerwall 2 may need to be about its current cost to be financially worthwhile. Perhaps blockchain type technology will make large scale distributed systems more practical in few years time but who knows with advent of EVs? Thanks Greg. Your last sentence is very important, and often overlooked - even by people within the industry. I see far too many marketing posts "save money with a battery installation," so it's important people understand this statement is more than likely not true. Thanks for the feedback Keiran. Like you say even without taking additional detrimental factors into account the financials for batteries don't work, so we won't worry about them yet. I also prefer SA's policy idea as it's still important to get the "battery ball" rolling. 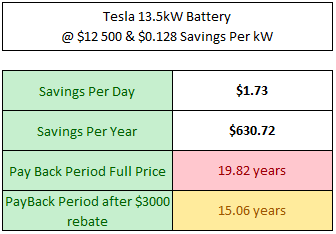 Hi Mark, I re-ran your calcs using a 10kwH battery as an example, and I quickly realised the savings are always $1.28/day (0.128 * 10) = $467/yr. It's important to understand usage patterns which are generally > 60% usage at night (I'm in Melbourne, so even more here). This means that you will almost always fully charge your battery before you start exporting to the grid. Only with a large battery does the battery efficiency drop, so the figures you've generated will almost always be valid, especially for the Samsung case. The difference between feed-in tariff and cost/kwH is what makes the difference. Ah, I had noticed that you guys were on the approved list for solar suppliers but not battery suppliers (I was looking for you because I always enjoy reading the blog). I really enjoyed this article Ben – like some of the other comments and you have pointed out, it doesn’t take into account things like battery efficiency, degradation, future prices, etc., but it shows that the economics aren’t even really close enough yet to worry. Personally, I much preferred the policy idea from SA – to pay for the entire installation of solar and batteries on public housing and low income properties, then allow a retailer to aggregate the batteries and get additional benefits from them. Thanks Robert! Good point, and there's many other considerations to make. We figured if even in the best case scenario batteries don't make financial sense, then that's a solid story to tell. Hi David, No I haven't taken future electricity prices into account, or future Feed In Tariffs, which also impact payback periods. However, I haven't taken battery degradation into account either, which negates any price increases. Also to remember; if electricity prices fall or feed in tariffs increase, the payback projections for batteries could end up being worse. Time also has the opportunity to bring about better battery technology and better prices, so there's no harm in waiting. What about the price of electricity in the next say 5 years, has that been taken into account?